While it is clear the Obama Administration weaponized the FBI, DoJ and Intelligence Community against the Trump Campaign, the Media Industrial Complex (MIC) has no curiousity as the US Constitution and civil liberties were tore to shreds. As the phony dossier was used as the basis to get court approval for a Foreign Intelligence Surveillance Agency (FISA) wiretap, the US federal government was unleashed against Trump and his associates. Special Prosecutor Mueller should refocus 100% of his energies and resources on these crimes but the question remains, is he part of the MIC Coupe? The coming six months should reveal how strong the Deep State is and how an unlikely President revealed decades of corruption within our government. 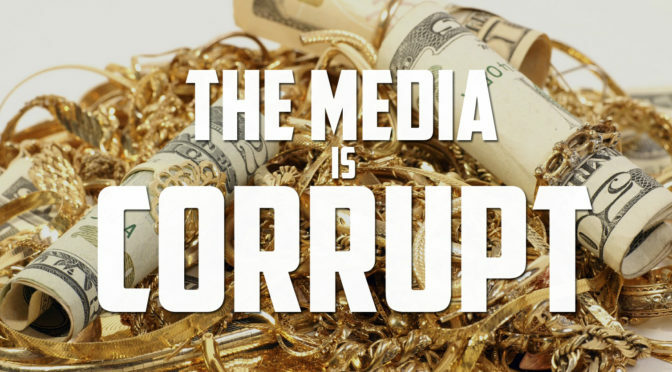 The Media Industrial Complex (MIC), a committee of the top five failing news media outlets in the US (CNN, MSNBC, the NY Times, The Washington Post, CBS and ABC/ESPN), has self-imposed their collective purpose to destroy the Trump presidency by reporting falsehoods, conspiring with the Democratic Party and creating fake news 24/7 to ensure everything they report on the Trump presidency is negative. Like the Chinese Politburo Standing Committee (PSC) or former Soviet Union they believe they can control public opinion and ensure a failed Trump presidency through lies and manipulation. To quote Candidate Trump from the debate stage, “wrong!” Their negativity and fake news is the wind in Trump’s sail. The MIC is a threat to America as they work to shape thought and punish those that disagree with them. It’s ironic that President Trump, not always a man of virtue like most of us, is built to take on decades of institutional rot in government, the economy, foreign policy and the failing MIC. It is priceless to watch the media elites struggle and demonstrate their fragile psyches trying to match wit with a president they treat with such little regard as they own the headlines and airwaves each day. However, in 140 characters or less, President Trump puts them on the ropes, knocks them down on the mat and showcases them for the elites that they really are. The most amazing thing overall that Americans have learned from Trump is the MIC is composed of liars, incompetents and sycophants that conspire each day to undermine America and undermine the American voters that put President Trump in office. Put yourself in Trump’s shoes for a minute and think about the media assaults and deep state attacks he withstands each day. Most people would wilt or quit under this relentless pressure. Not Trump. Like President Lincoln said of General Grant, “he fights” and it is a glorious thing to observe. Here is a billionaire President who is putting America First centering policy on the “forgotten man” and putting allies and foes alike on notice directly telling them the United States will not be taken advantage of anymore. No more apologies, no more bad trade deals and no more remaining silent while Americans, the Forgotten Man, continues to be on the losing end of the deal. President Trump has exposed the Media Induistrial Complex, the political establishment and lobbyists that reside in The Swamp for the self-serving lot that they are. For the last several decades the will of the American people has been secondary to special interests, political correctness and the whims of the elites while Congress and The Swamp enriched themselves at the expense of the American people. It took a blue collar billionaire to fully expose what most Americans suspected; the 53rd Regiment finds it refreshing to watch President Trump put the twitter spotlight on the failing MIC (CNN, MSNBC, the NY Times, The Washington Post, CBS and ABC/ESPN) while the establishment and elitists scatter like cockroaches looking for cover under old appliances and cabinets.